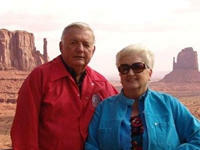 Traveling Team Rudine: Ken & Yvonne Rudine's Texas and US Travels. Lighthouses are frequently thought to be haunted. This is one such case. I am a native Houstonian. Born in 1931 my father was from Wharton County and my mother was from Angelina County. My dad introduced me to the photographic process before I was a teenager. In 1950 the Korean War and my enlistment in the USAF sent me to Europe, North Africa and San Antonio, where I first appreciated the Hill Country in particular Bandera. In 1958 I started a darkroom business known as 5P Processing Laboratories. As Houston was still in its first decade of building air conditioned houses and my brother asked me to manage his air conditioning business. He subsequently entered the apartment development and I moved on to be a Manufacturing Manager managing Triangle Engineering a manufacturing company making Turbovents (roof mounted, wind driven, rotary ventilators that cooled attics). I have four U. S. Patents relevant to ventilation. During these times I had photo-journalism articles published in Popular Mechanics, Camping as well as photos used in advertising, but mostly my photography was for me. Yvonne Clouse was born in Elgin, IL. Although basically from southern MN some of her high school years she attended high school in McAllen TX, later graduating in Owatonna, MN. Afterward she attended Hamline University in St. Paul, MN. She, her husband and first daughter moved to Houston in 1965 joining her parents who lived nearby in Bellaire. Yvonne and I were married in 1979. At the request of my cousin, in 1998 I became computer literate. Yvonne and I have long believed in what goes around, comes around. Through a freak chain of events in 2003 I received a digital camera. Soon afterward, I was asked if I knew of Shanghi Pierce. I searched the web and simultaneously found Shanghi in Texas Escapes. Recognizing this as what I think is God's work I immediately began contributing photos and information. Over the years we have refined our methods to acquire our magazine contributions into team work. Yvonne drives while I concentrate on navigation and photography. We soon discovered that as we worked we were not as invisible as we thought. We realized that someone is always watching so we began to initiate conversations. The response is amazing - try it. Our name can be pronounced a few ways, so in this case I have tried to help people overcome that obstacle by combining the "rhyming word team" with Rudine. Hence we use the name The Rudine Team and/or Traveling Team Rudine.